I am in SE Alaska right now on a photo shoot. Every year, around mid Spring to early Summer, Humpback whales arrive in large numbers in Alaskan waters to feed on the abundant food source. They sometimes feed cooperatively using a method called BNF. Bubble Net Feeding is perhaps tied with Breaching as the most exciting cetacean behavior. 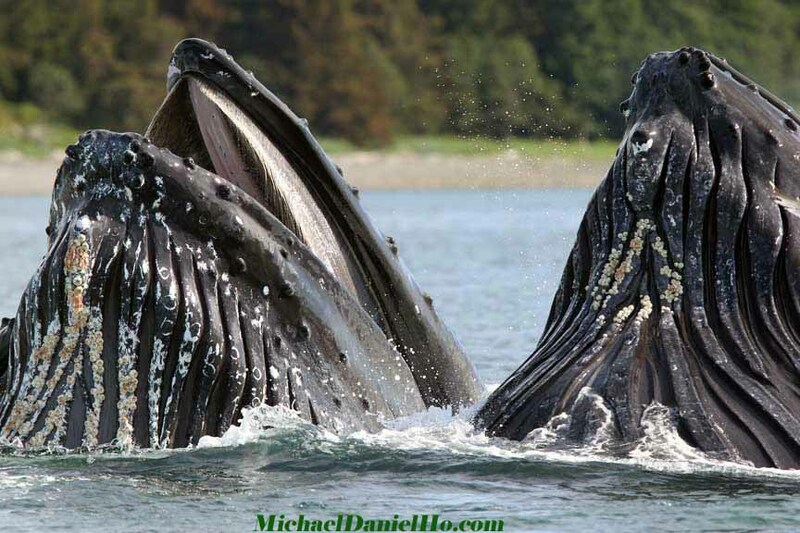 It is apparently practiced only by Humpback whales and primarily in the food rich waters of Alaska in the summer. Other cetaceans are known to use bubbles to catch prey but the Humpbacks are unique in their method. It seems each whale knows the role it plays in the sequence. They all dive in unison when a large school of fish has been identified as the target. The lead whale blows a circular curtain of bubbles, beneath the school, and use it to contain the fish. The bubble blowing whale changes the depth of bubble deployment, depending upon where the prey is in the water. The panic-stricken fish start to gather in a tight ball and move towards the surface, contained by this cylinder wall of bubbles. Then again, in unison, the group rises to the surface with their gaping mouths wide open and swallow tons of water and fish together. This can be repeated many times until the fish are depleted or their appetite are sated. Thankfully, BNF is not as unpredictable as Breaching because if one is vigilant, one can see small bubbles rising from the deep. This is usually preceded by sea birds (mostly gulls) hovering around an area trying to pick off small fish escaping the menacing bubbles. This photo was taken in Hoonah, Alaska. A small pod of Humpbacks were deploying this method and came up repeatedly with their huge mouths wide open. It was quite a sight to see. 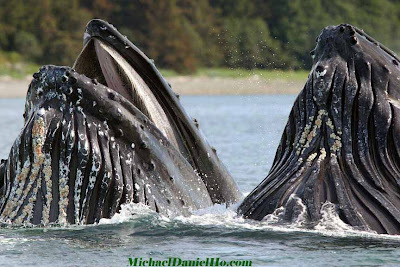 Visit my website MichaelDanielHo.com to see many more exciting whale photos from Alaska and all over the world.